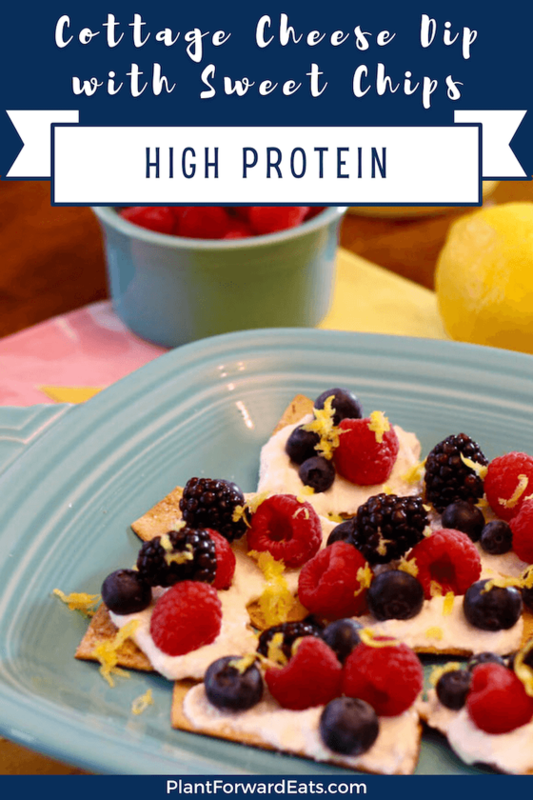 Get excited for a delicious dessert that also boasts plenty of filling fiber and protein! Try these dessert chips once, and you’ll definitely want to make them again and again. I come from a long line of sweet tooths. To say I love dessert would be an understatement! But as a dietitian, I aim for desserts I eat at home to be healthier and on the lighter side. So I set out to make a base of dessert chips with Flatout’s ProteinUP Carb Down flatbreads. Each flatbread offers 12 grams of protein (almost a quarter of the daily value) and 10 grams of fiber (40 percent of the daily value), helping to keep you fuller for longer. That’s more than you can ask for from most desserts! Making chips from the flatbread is super easy, thanks to kitchen scissors. I simply treated a non-stick cookie sheet with cooking spray, cut some flatbreads, and placed those pieces on a cookie sheet. I covered the chips with cooking spray and nutmeg sugar, and then baked them—they were ready in minutes. And here’s some good news: Several Flatout flatbreads and pizza crusts are now endorsed by Weight Watchers ® for between 2 and 4 SmartPoints ® values per flatbread. The Flatout ProteinUP CarbDown flatbread that I used for this recipe has a SmartPoints value of 3. 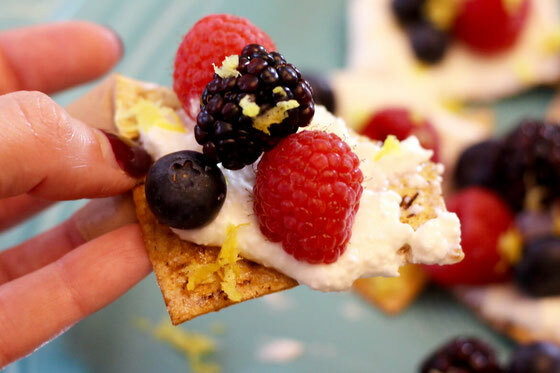 As a topping for the dessert chips, I whipped up a creamy spread with protein-rich cottage cheese and plain Greek yogurt—and sweetened it with a little bit of lemon juice and honey. Then I topped the chips with berries and lemon zest. Oh, were they delicious! The best part is these chips are simple enough to make for a weeknight dessert, yet they’ll also impress your dinner guests. Preheat oven to 375° F. In a small bowl, combine sugar and nutmeg; set aside. Treat a large non-stick cookie sheet with cooking spray. Use kitchen scissors to cut flatbreads into chip-sized pieces, and place on cookie sheet. Coat with spray oil, and sprinkle with nutmeg sugar. Bake until crisp, about 5-7 minutes. Remove, and set aside. Place cottage cheese, yogurt, juice of ¼ lemon, and honey in a food processor; process until smooth, about 45 seconds. 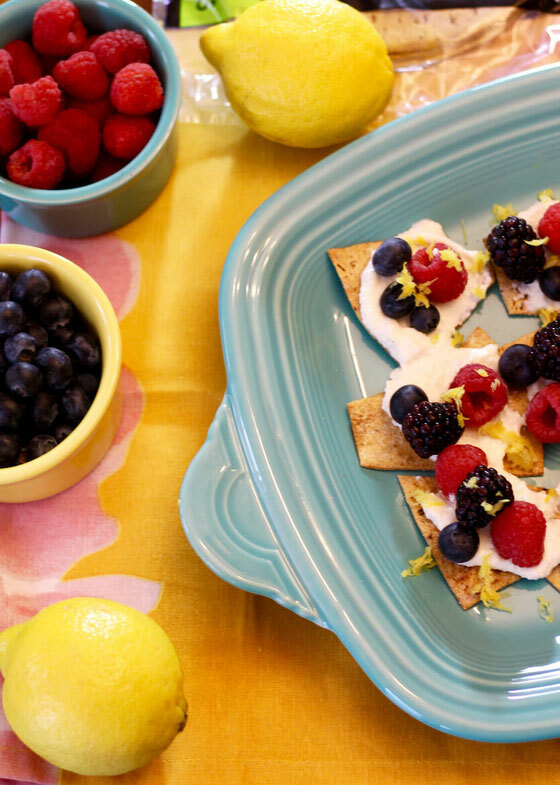 Spread chips with cheese mixture, then top with berries and lemon zest. Serve immediately. Serves 4. What are your thoughts on this topic? 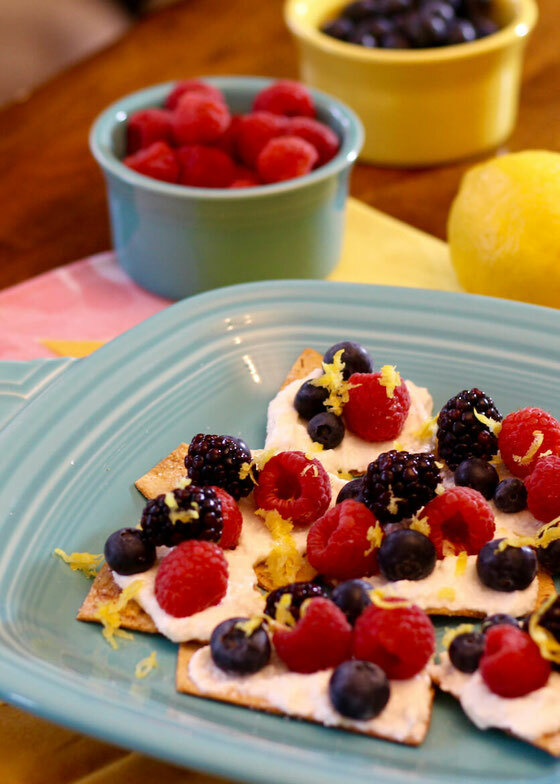 Have you ever made a dessert with flatbread? What are your favorite healthy desserts?